Ryanair is looking to increase its operations in Israel. The low-cost carrier’s CEO Michael O’Leary held meetings with Ministry of Tourism and Israel Airports Authority officials to discuss the airline’s plans this week. Ryanair’s chief executive was clear his airline could bring “millions more” to Israel when interviewed by Israel Channel 13 TV News. “People are fed up with destinations like the Canary Islands and such places. Israel has wonderful beaches and very good food,” he said. “If we can offer reasonable prices, then Israel with its weather and beautiful beaches can become a preferred destination. 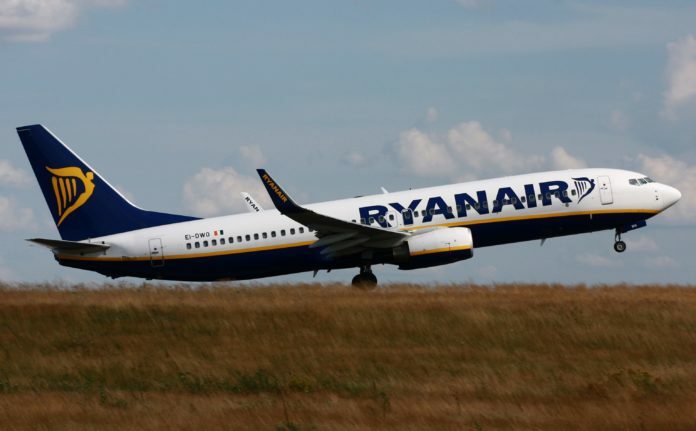 O’Leary, who met with Tourism Minister Yariv Levin, asked if Ryanair could set up a base in Israel to expand its routes. “There is potential for a significant growth in Israeli tourism,” he added, and noted Ryanair could offer over 200 new airports and destinations to Israelis. O’Leary also vowed that Israelis and tourists could enjoy the company’s low prices. Furthermore, he anticipated offering domestic flights and requested early morning slots from Ben Gurion Airport. Ryanair recently introduced new routes from Tel Aviv to Athens, Thessaloniki, Sofia and Bucharest, bringing its European destination tally to 15 countries from Ben Gurion. The Irish carrier also operates 15 routes from Ovda in Eilat. But O’Leary is of the viewpoint this is only the start. Ryanair flew 600,000 passengers to and from Israel last year, treble the number in the previous 12 months. Some 85,000 passengers utilised Ovda, double 2017’s figures. A partnership agreement last September between Ryanair and Air Europa offers Israelis flights to Miami, Venezuela, Colombia, Peru and Paraguay, with a stopover in Madrid. O’Leary expects Ryanair to top easyJet and Wizz Air within two years. Ryanair’s news came shortly after Prime Minister Benjamin Netanyahu opened a new international airport outside Eilat. It is hoped that the Ilan and Asaf Ramon Airport will boost winter tourism, but Ramon Airport will also serve as an alternative to Ben Gurion during times of conflict. The $500 million facility, is named after Israel’s first astronaut, Ilan Ramon, and his son Asaf, killed in an Air Force accident. Previous articleAsk The Rabbi – Was Burying Remains of Holocaust Victims Really Necessary?